Cascading Style Sheets (CSS) is a style sheet language used to describe the look and formatting of a document written in a markup language. 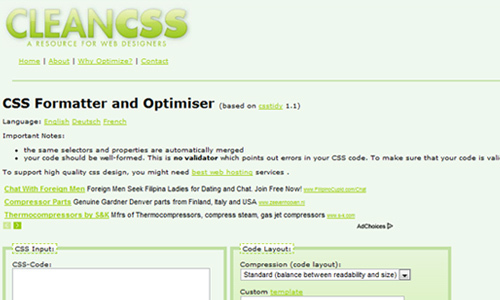 The CSS Compressor is basically used to compress CSS by removing all unnecessary characters from source code and therefore reducing the code size and make your web page load faster without changing its functionality. These unnecessary characters usually includes comments, white space characters, new line characters, and sometimes block delimiters which are only useful at the development stage of the web page. There are three different levels of compression mode. 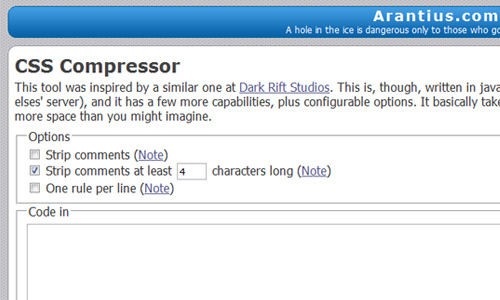 These are the light, normal, and the super compact compression. 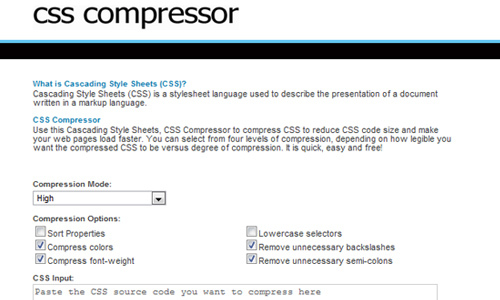 Choose from these different levels of compression depending on how legible you want the compressed CSS to be versus the degree of compression. Here are the 20 Useful Examples of Web-Based CSS Compressor to help you compact your CSS code into the smallest size as possible, hence, improving the load time performance of any website. Take time to browse this list as these tools can automatically do this time-consuming job for you. Enjoy! 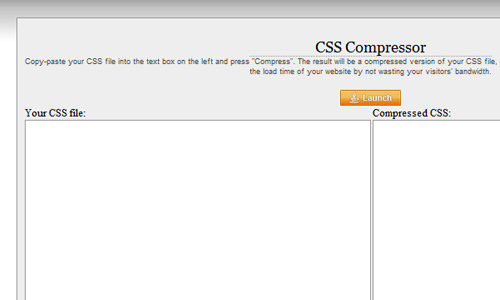 CSS Compressor by Sevenforty is an online tool which will quickly compress your CSS code by simply uploading your style sheet, selecting the line break option, and hitting the compress button. 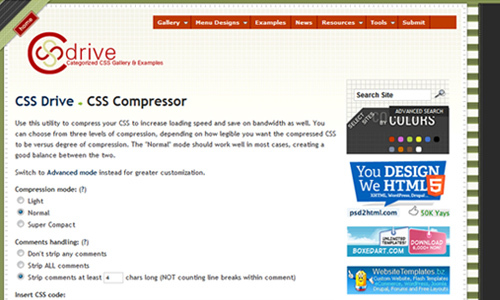 CSS Compressor by CSS Drive is a free tool you can use to compress your CSS to increase loading speed and save on bandwidth as well. 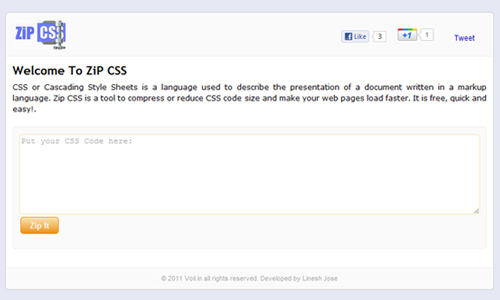 ZiP CSS is an online free tool which compresses or reduces CSS code size and make your web pages load faster. CleanCSS is a powerful CSS optimizer and formatter which uses a variety of different compression settings to generate clean and concise CSS. 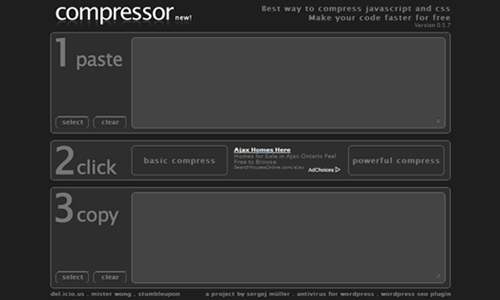 CSS Compressor is a free online tool to compress your css. 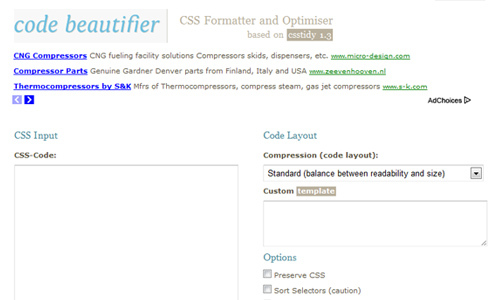 Code Beautifier is a CSS formatter and optimiser tool created by Arkikstudio which was based upon the famous CSSTidy. 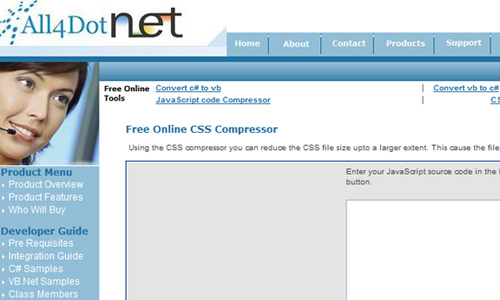 All4DotNet offers a free online tool to compress CSS code in order to reduce the CSS file size upto a larger extent. 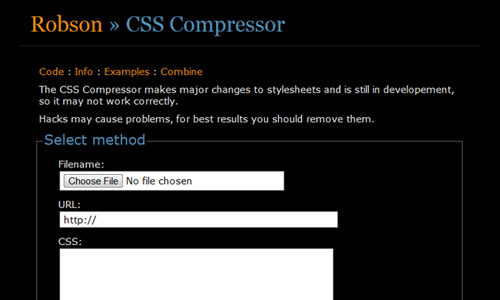 CSS Compressor by PHP Insider is one of the easiest tools you can use to compress your CSS code in just couple of clicks. 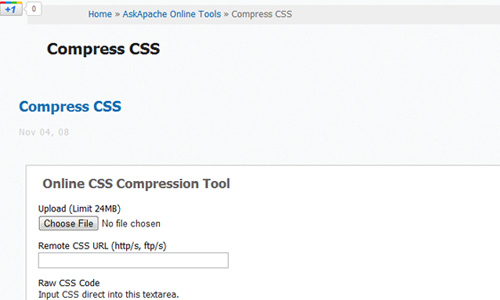 AskApache.com – CSS Compressor is a very good and effective tool which allows you to upload the CSS file to be compressed, specify the CSS file URL or even paste the CSS code into the form field. Robson – CSS Compressor is a popular open-source CSS Compressor which gives you some possibilities to reduce your CSS code. 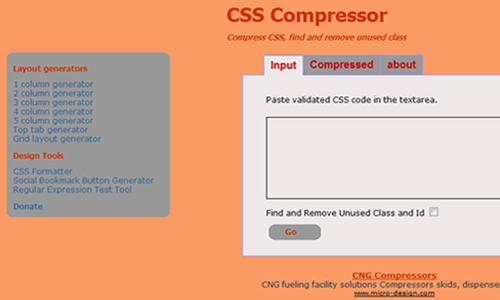 PageColumn – CSS Compressor is a tool which find and remove unused class then compresses CSS. 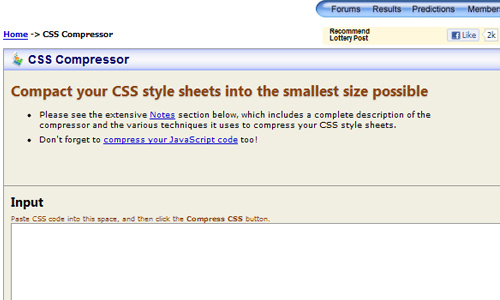 Lottery Post’s CSS Compressor greatly reduces the size of standard CSS style sheets into the smallest size possible. 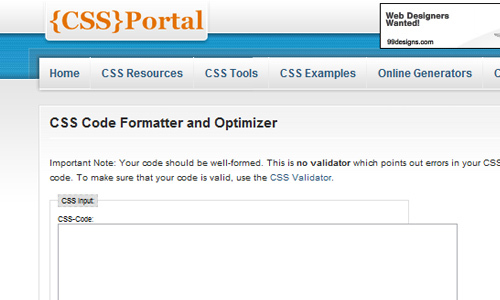 CSS Portal – CSS Code Formatter and Optimizer is a worth trying tool which points out errors in your CSS code. 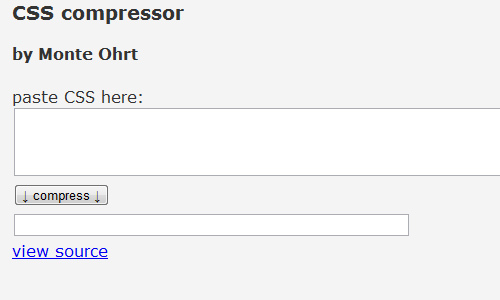 Shygypsy.com – CSS Compressor is a tool which will provide a compressed version of your CSS file to speed up the load time of your website by not wasting your visitors’ bandwidth. 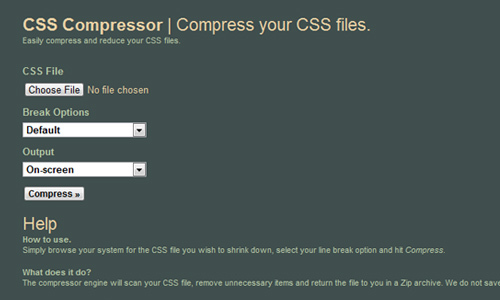 CSS Compressor is a free tool which enables you to reduce file size and make your sites load faster for free. 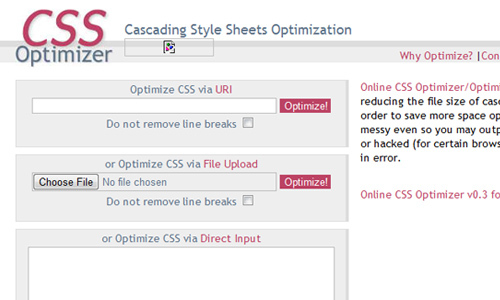 CSS Optimizer optimizes and reduces the file size of the Cascading Style Sheets. 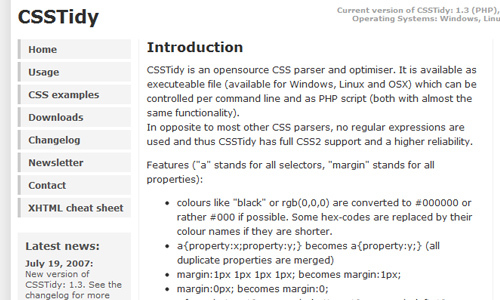 CSSTidy is an open source tool written by Florian Schmitz to optimize your CSS files. 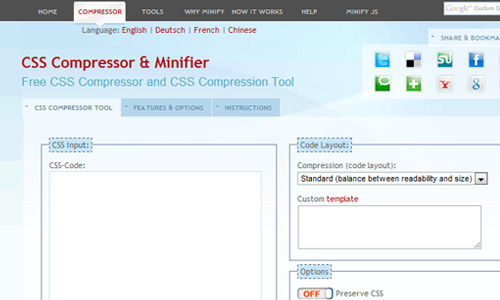 Minify CSS – Compress CSS Code is an online tool which give any users easy one click CSS compression. 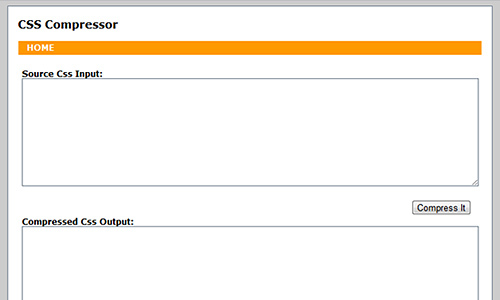 I personally just use CodeKit’s built in compressor / minification process. It seems to help out tremendously on Google Pagespeed results.